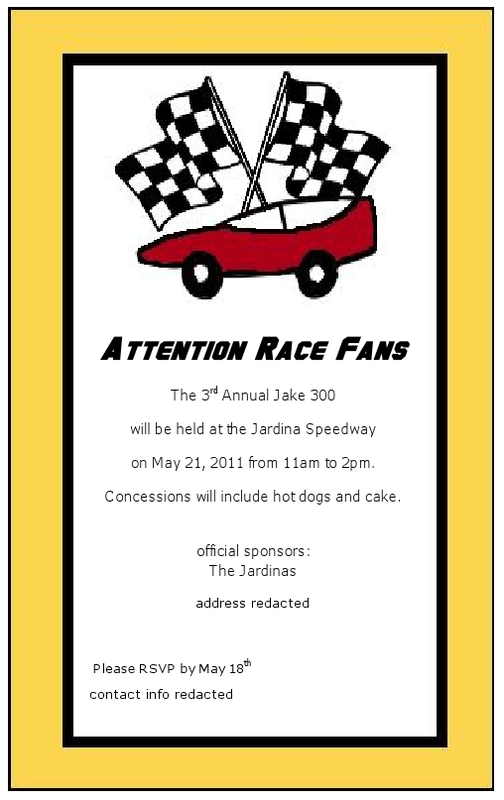 Jake loves the Disney Cars movie, so we decided on that (and a general race car vibe) as the theme for his party. Since the guests ranged in age from 4 months to 8 years I try to keep parties loosely structured and just provide plenty of room to run, a few toys to play with and I always fill up our water table on the deck. I like to keep everything simple and just focus on everyone having a good time. The invites went out about a month in advance. I made them using free fonts from Dafont.com and Gimp. I made everyone a Pit Pass, but a lot of them got left behind. The parents thought they were cool, but apparently the kids not so much. The lanyards came from Strapworks.com and the pit passes were made using Dafont and Gimp. I “laminated” them between two pieces of clear contact paper. Jake’s said “Driver”, mine said “Lead Mechanic” (because Mom fixes everything) and my husband’s said “Pit Boss” since he was in charge of the grill. 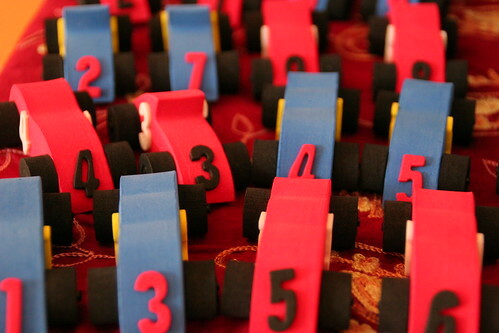 I also made these little foam race cars from a kit I found at JoAnn’s. My original idea was to have the kids put them together, but I decided that wasn’t such a good idea. Maybe when they’re older, but at this age it’s best not to try to make them sit and do fiddly things. This was the toy favor. For the big favor I made reusable snack bags and filled them with snack mix. 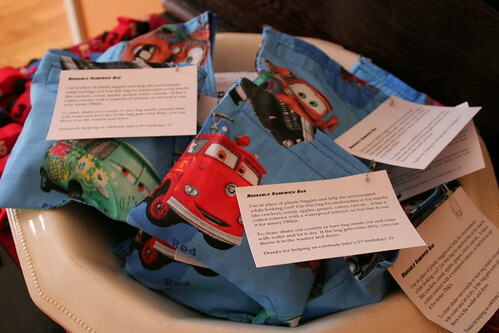 I found the Cars fabric on Etsy and lined them with PUL I already had from making cloth diapers. The snack mix is one I routinely make for Jake. He’s allergic to peanuts and can’t have many commercial mixes so I put together his own. It has animal crackers, cheddar whole wheat goldfish, chocolate graham goldfish, dried cranberries, cheerios and pretzels. I had wanted the bags to be sandwich sized, but I can’t do math on the fly and didn’t have time to make a mock up. Both of those were actually big hits. 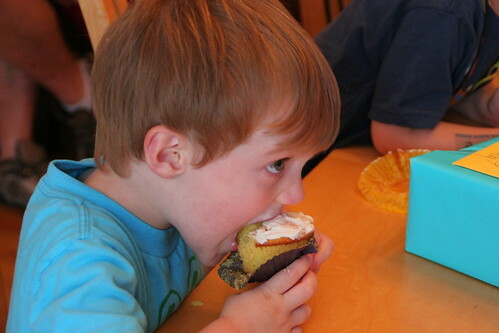 And of course the cupcakes. I had this idea to make little roads for each one from chocolate melts and then put a car gummy on each road, but that proved too time consuming and I cut it when I realized I was already going to be up really late the night before. 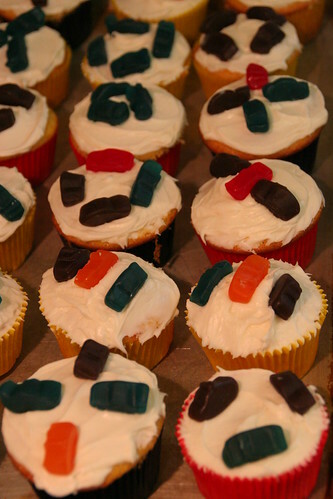 So they ended up just having the car gummies as decoration. 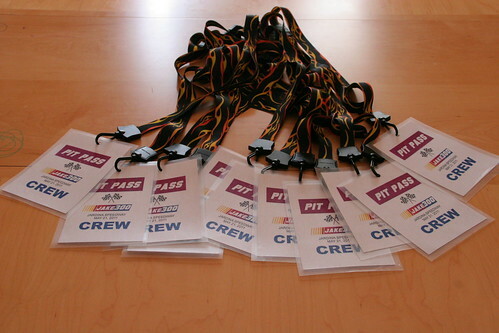 I love the pit passes, really cool idea! And the reusable snack sacks are a great idea, yummy and mums can use it afterwards. Great ideas all! Thanks Pili! I really wanted to give something that would be useful and eco-friendly. I know I have tried hard to make Jake’s lunches as trash free as possible, but snack bags are always a sticky thing. Now I want to make more for myself! This was definitely the push I needed to make some for myself, but now I want more (and bigger ones)! I really hate it that we couldn’t come to Jake’s party. It looks awesome, and Dean and Quinn would have loved it.